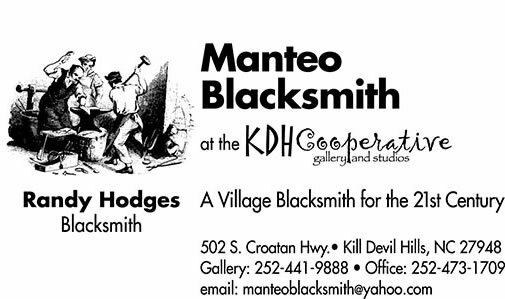 Manteo Blacksmith is the blacksmith shop of Randy Hodges. The work created at my shop and studio is usually a combination of hand wrought ironwork produced at a coal-fired forge and metalwork produced by more modern fabrication methods - with an emphasis in use of recycled materials. 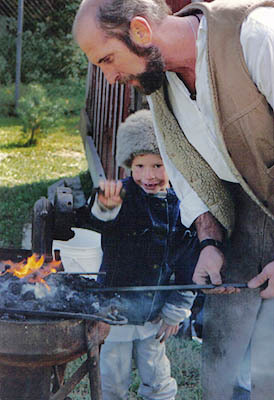 I am committed to the belief that there is a role for hand forged ironwork in modern American culture. 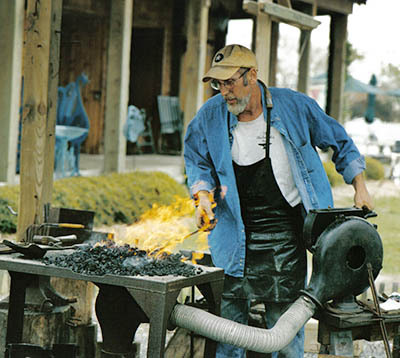 Since 1999 the Manteo Blacksmith Shop has created unique pieces for homes and gardens both near and far. The Manteo Blacksmith creates custom projects of both utilitarian and artistic nature. Let me know if you need ironwork for your home or business. Also, please stop by the KDH Cooperative Gallery to see the sculpture and artwork that is the driving force of my work.